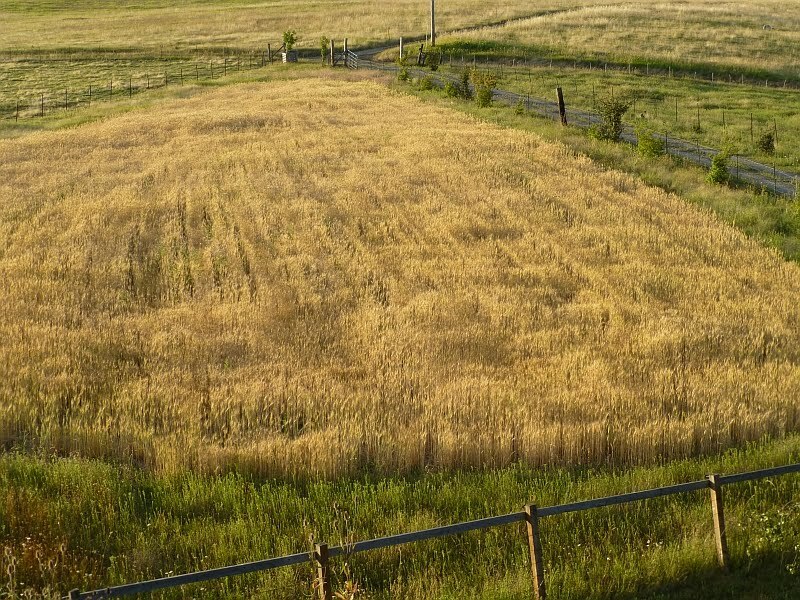 Some of you may remember our wheat-growing experiment from a few years ago. North Idaho is wheat country. Take a short drive anywhere beyond our property, and you’ll see vast swathes of cultivated Palouse prairie. 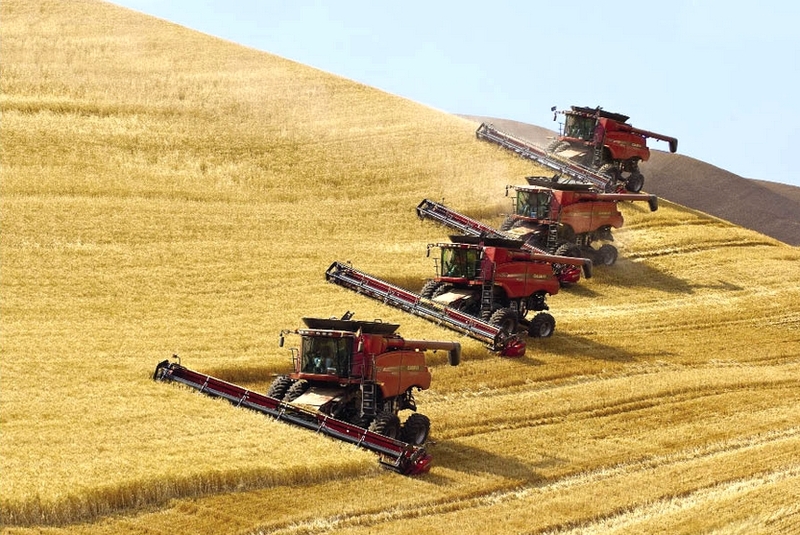 In late summer, massive million-dollar combines rumble across the fields, cutting wheat at a precise height, vacuuming up the grain heads, threshing it, and spitting out the clean wheat from one side and the chaff from the other. These machines are awesomely efficient. Whenever you buy flour at the store, or consume pastry or bread products, you can thank the thousands of hardworking farmers who grow wheat for our country. But what about growing wheat on the individual level? That was what our wheat-growing experiment was all about. 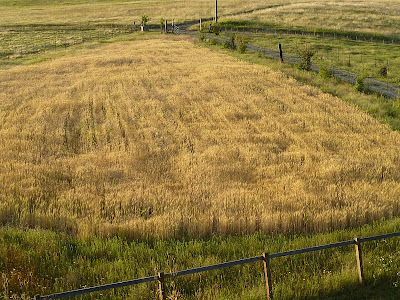 Was it do-able from the standpoint of a small homestead? How hard would it be? We set out to learn. The first time we grew wheat, we plowed the field once in the fall, then sowed hard red winter wheat. This wheat sprouts in autumn, goes dormant over the winter, and grows again in the spring, then is harvested in late summer. It worked great except for one thing: we couldn’t control the weeds, notably cheatgrass. It’s not like we could plow the weeds under while the wheat was growing. We ended up growing half wheat, half weeds. The experiment was a failure. So how do commercial wheat growers control weeds? Partly weeds are controlled with sprays; and partly they’re controlled by continuous cultivation. We wouldn’t do the former and couldn’t do the latter (yet). With the exception of plowing the field, everything else was done by hand. We sowed. We scythed. We raked. We bundled. And we threshed. Or at least, we tried. While the whole wheat-growing venture was challenging but otherwise fine (and repeatable), it was the threshing that did us in. Threshing wheat by hand, using flails, is inefficient, wasteful, physically difficult, and wildly time-consuming. In this respect, the experiment was, once more, a failure. Grrr. 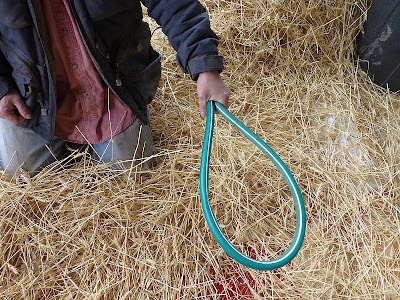 One of the ongoing things we’re trying to do on our homestead is to figure out what works and what doesn’t when it comes to self-sufficiency. Wheat is an integral part of most Americans’ diets, yet threshing stymied us. 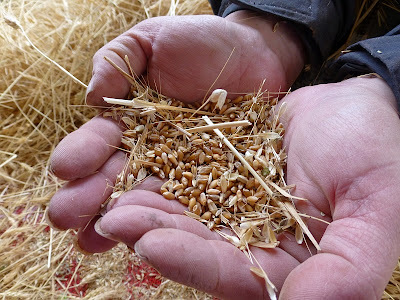 We needed to find out how to grow wheat with the less-sophisticated hand-powered methods suitable to a small homestead. So, in an attempt to continue our research, we decided to purchase this thresher and conduct a product review regarding its efficiency. How well does it work? What are its drawbacks? How efficient is it? How difficult is it to use? Can it thresh enough wheat to feed a family from year to year? These are some of the questions we hope to answer. Backwoods Home Magazine has already expressed an interest in an upcoming article on the subject, and I suspect a number of other magazines would be interested as well. The thresher we purchased came from a place called Back to the Land Store in Tennessee (which closed its retail location shortly thereafter and has plans to open an online-only store). The gentleman I spoke to told me the machines are hand-made by an Amish family living nearby. He said it will thresh about 1.5 lbs. of wheat per minute (at top speed); and the drier the wheat, the better it threshes. 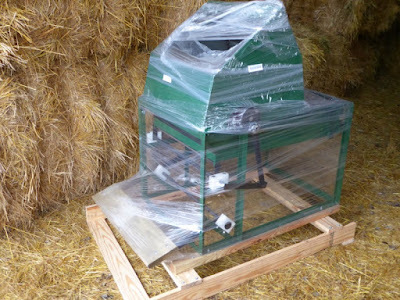 The cost of the machine as well as shipping it to Idaho came to around $1200, so it was not a purchase to undertake lightly and it took us awhile to save up for it. The thresher was shipped in mid-November and arrived without incident. Right now it is being stored in the barn until we have a chance to put it to use next August. Come May, we’ll re-plow the same field we used before. We’ll repeat the triple-plowing to control weeds. We have seed wheat ready to plant. We have scythes ready to sharpen. Now we have a thresher ready to thresh. Stand by for a product review! Does it have the option to power it by a motor (a pulley perhaps)? If it does, for now you could use an AC motor, and fit it up to a DC motor for "grid down" times (off a battery and solar charger). Trust the Amish to have a solution! I hope this works out for you. I couldn't live without wheat and the many things I make from it. Remember that anything treadle or pedal powered can also be rigged up to wind, water or gasoline power or even animal power, as well. several families could share the use and spread the $$ around. Mother Earth News has an article about a drill, rod with chains and a 5 gal bucket being successful at threshing. I suspect this is on a fairly small scale and may damage the berries. this option worked best for us, in a poly garbage can. we tried several different threshers, hand threshing, etc. the drill/chain was FAST, reducing the can of wheat to chaff in less than 30 seconds, and didn't seem to hurt any of the berries. it also seemed to be the best for winnowing. That sounds exciting! I love man powered everything (except my snow shovel! :) and can't wait to see the results. Will be waiting for the rest of the story. I am sure it will good news. Have seen several stories of these being used in poor countries. Have not seen a followup story, after several years of use. Concerning your weed problem in fall wheat, you might try setting aside part of your field, as "summer fallow". Do not plant anything, then several times during the summer run a cultivator over the ground, uprooting the weeds. Bottom line best of luck with your new machine. Time to wish everyone at your home a "Happy New Year". May the good Lord be with your family. It will be fascinating to hear how it turns out!! Eagerly awaiting news of your results. God bless you for being so brave as to run our risks for us. Truly, you are an angel. Don't get it. You most likely won't use 1200.00 in wheat the rest of your life, not to mention wheat is bad for you. I'd buy wild rice.. I agree that based on today's conditions $1,200 would never fly with most folks. Montana Gal would move me and my stuff me to the outhouse. Urgency, like beauty is in the eye of the beholder. Most folks would look at the picture of the 4 combines and visualize them moving gracefully in sync across the field. Survival-minded might look at it and see four million-dollar combines sitting in a field, right where they (and everyone else) ran out of gas. I wonder if it could be used to thrash beans and dried peas? 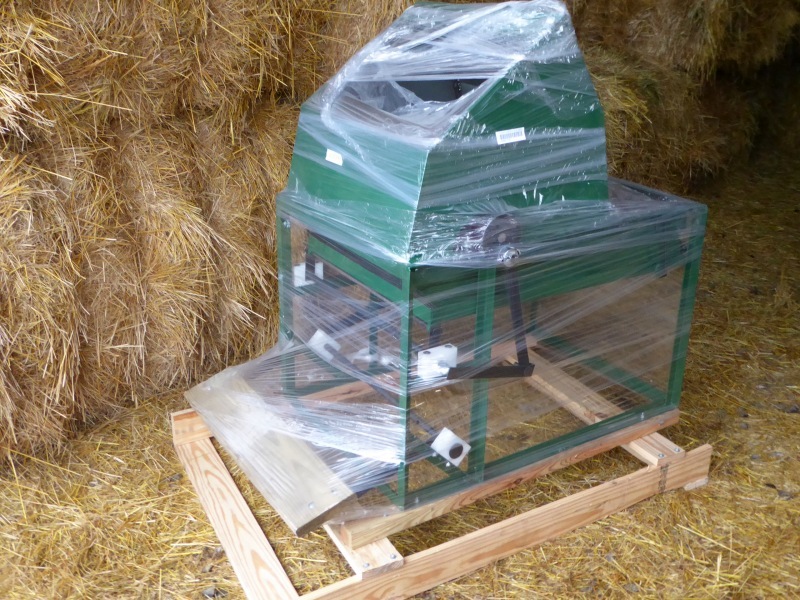 You would also end up with bedding/compost/soil conditioner/ect after the wheat is thrashed. I like the idea of being self sufficient, but the million dollar machine people would fill up your barn for $1200. Wheat stores. I will be interested as well to hear the results. I think threshing is the one thing that makes small scale grain raising so impractical for so many. Must be nice to have more money than you know what to do with. Patrice, I don't know why people have to make nasty comments. (and of course they are anonymous) Talk is cheap, you guys are actually doing things to be self-reliant. I would like to thank you for sharing your experiments and the knowledge gained. You are a source of encouragement to me and to many others. Similar machines are common in the Philippines, where my wife is from. somewhere I have pictures of me using one. It requires some balance and coordination, since their practice is one person both powers and threshes the rice. The machines are pretty light, they just out a couple poles through it and carry it from one field to the next. The people who own them usually have a crew(or family) going from one field to the next, working for a share of the rice. It is then spread on tarps in the sun to dry it enough for storage. As for milling, to remove the husks, I haven't seen that done by hand, most in her family's area take it to commercial mills, again paying with a share of the rice. Have you considered planting oats instead? I try to avoid wheat whenever possible -- besides the problem of lectins in wheat, there's plenty of other stuff that can happen when wheat flour oxidises, which is what generally happens in long-term storage even if you leave out commercial bleaching and fumigation. Seriously, give oat flour a try instead for a while and see if you like it. Couldn't you use a sickle bar mower to cut the wheat. I would imagine you could get a sickle bar attachment for Don's tractor. Hope your wheat experiment works well. We used the "chains and bucket" method for both oats and barley last year with great success. It does require breaking the harvest down into manageable units, but is just barely this side of free and works very well. It does not work for beans (and yes, I do know) unless you like your beans powdered. Too much power. I suppose you could experiment with the RPMs on the drill but I got frustrated with wasting crops I worked for and went back to hand processing the dry beans. Very cool. It would sure give you a work out. I notice the older folks where watching and handing bundles as needed. That would be me. After a few minutes on that pedal I would be done. Which king will it be, America?